Give your marketing a boost as we race towards Summer, let 1000’s of readers and book lovers find YOUR books to add to their Summer Reading list with our “Author Appreciation Week Special “. This week long Facebook, minimal participation, event attracts thousands of active readers. One social link for the rafflecopter to drive traffic to your blog, newsletter, twitter account or any other social site. TWO prizes that will be given away during the daily FLASH Giveaways on our Facebook event page (prizes could be: e-book, paperbacks, swag, gift card, etc). 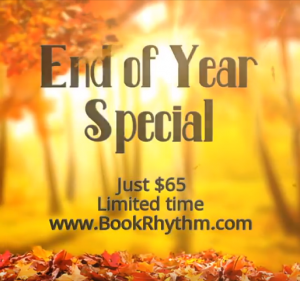 This is a single, month to month, VIP marketing special on BookRhythm’s social media. Author will get THREE promotional posts per week (a different one each week or the same one for the entire four weeks) on BookRhythm’s social media accounts for one month. One promotional link to go with each of the posts. One promotional picture (to be provided by the author) to go with each promotional post. Please also keep in mind that BookRhythm can help you every step of the way…all you have to do is send us an email. The total of activities involved in the transfer of goods from the producer to seller to the consumer to buyer, including advertising, shipping, storing and selling. All of these definitions are correct and it is the scariest and sometimes, most time consuming part in becoming an author. We are here to help. BookRhythm has spent the last few months putting together a blog series. The series will give you the steps to follow, and help give you begin with tasks needed to enable you to accomplish your goal and launch of your BRAND. The first week is all about your social media presence. This is not the only way you will market yourself or your books, but it is one of the easiest ways to get your name out there. It is also the one that many spend way too much time on, as they are not organized about their approach. Extended bio for your website, social media, and media kits. This should be approximately 250 words; normally in third person. Medium length for blog tours, small media publications and such. Once you have finished your extended bio, your secondary bio should be approximately 100 words, highlighting two focal points from your extended bio. Brief bio for bylines and any site with limited characters. A quick 25 word version with possible bullet points. What hobbies do you have outside of writing. In essence you need to answer who, what, where, when and why in your bio, but in a way that connects with people. Don’t forget to pat yourself on the back. A little self promotion can go a long way. Once written, make sure you have multiple people read it over and give feedback. You may even want a profession proofreader/editor to take a look at it. Remember this is how the public will be introduced to you and you NEVER want it grammatically incorrect. To check out our services, not only Marketing, please click HERE. Want our help in proof-reading your bio, CONTACT US today. Don’t miss any of the 10 Steps Start to Marketing Series. Thank you for joining us as we launch our new website with all its new bells and whistles. Take a few moments to look around and see what’s new.